A “Jewish work of art” is either a work by an artist whose Jewishness clearly influenced his or her art, or a work by a Jewish artist that has had a significant place in Jewish culture. The Bible provides detailed descriptions of works of art that played an important role in Israelite religio-cultural life. We can still see works that have survived from the Hellensitic, medieval, Renaissance, and Enlightenment periods. Jews, influenced by their surroundings, have been involved in all the artistic genres–painting, sculpture, mosaic, fresco, architecture, the design of religious and household implements, manuscript implementation. The Bible, as the foundation and repository of Jewry’s collective memory, features many descriptions of work of sculptures and figurative art. At the entrance to Solomon’s Temple in Jerusalem stood 12 cast oxen, bearing on their back the great bronze “sea,” a huge open water tank described in I Kings 7:25. The walls of Solomon’s Temple were also hung with embroidered tapestries of cherubim. A bronze serpent, held to be the work of Moses himself, is referred to twice in the Bible (Numbers 21:82, I Kings 7:29). Prophets and biblical historians inform us that throughout the Biblical period, sculpture and carving were necessary crafts, practiced in every Israelite settlement. Figures of Baal, Ashtoreth, and Asherah [local deities, among those worshipped by Israelites in the nation’s infancy] were erected alongside the altar on rural high places and on sacred hills and under sacred trees. Homes had their teraphim, figurines of household gods of healing and welfare, which their owners would take with them on long journeys. The figurative and plastic arts fulfilled an important role in Israelite religio-cultural life. The Bible mentions three sculptors: Aaron makes the golden bull; Betzalel, the churbim, Moses, the bronze serpent. Figurative art since then had decorated Temples to Yahweh [the name given to the monotheistic deity that became–and continues to be–the one God of Israel], private homes, bath-houses, and theaters. 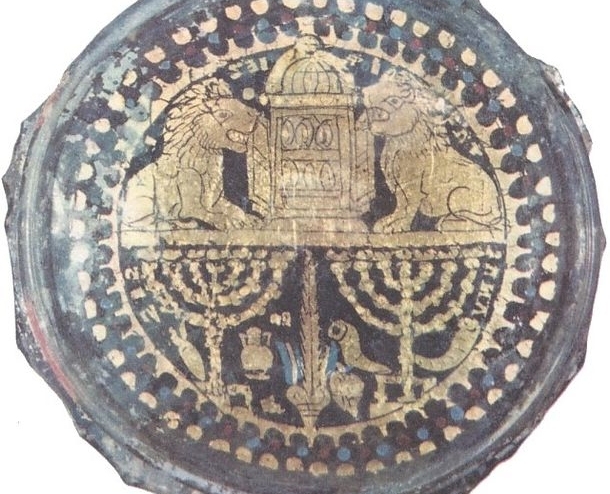 The decoration of synagogues in the Second Temple period was influenced by both Jewish tradition and by that of the artist’s host country. Jewish art has always been receptive to outside influence. The frescos in the Dura Europos synagogue and the floor mosaics of other synagogues in Israel and the Diaspora testify to the fact that the rich figurative art tradition of the Biblical period continued into the Hellenistic period and played a central role in Jewish religious life. After the destruction of the Second Temple and especially after Hellensitic armies and culture had conquered the Middle East, the Canaanite cults [which many Israelites continued to worship] disappeared and with them the figures of their gods that had been a feature of Jewish population centers. Even prior to the Temple being destroyed, synagogues were already being build throughout Israel and the Diaspora as communal centers for worship and study. It was long thought that figurative art was confined to floor mosaics, found in early synagogues as early as the fourth century B.C.E. The discovery in the 1930s of the Dura Europos, dating to the third century C.E.–its walls painted with frescos on biblical themes, crowded with representations of biblical characters–profoundly altered that perception. Hellenistic influence on Jewish art was also prominent in Herod’s restoration of the Jerusalem Temple and in other Jewish public architecture (the synagogue at the Cave of Mahpelah in Hebron, Herodian ampitheaters in Bet She’an and Caesarea, etc). There are numerous other examples of the penetration of Greek mythological elements into synagogue art. The synagogue at Hamat Tiberias (fourth century C.E.) displays a zodiac circle with Helios the su god and his chariot at the center. The most complete representation of Helios at the center of a zodiac circle is in the floor mosaic of the Bet Alpha Synagogue, where Helios is shown driving the four horses of the sun chariot. In the zodiac circle of the Tzipporit synagogue floor mosaic, the sun itself is the driver, one of its rays penetrating into the chariot as though to drive the horses. The fact that these myths made their way into Jewish folklore is evident in many passages of Talmud and Midrash.